George Bush was taken to a few different locations on Air Force One on 911. 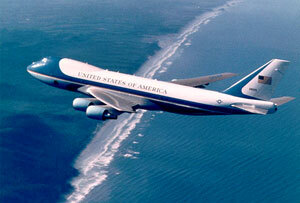 9:55 a.m. -- President Bush departed from Sarasota, Florida, in Air Force One. 11:45 a.m. -- President Bush landed at Barksdale Air Force Base in Lousiana. 6:44 p.m. – President Bush arrived at the White House in Washington, D.C.